This month's theme is Raids! 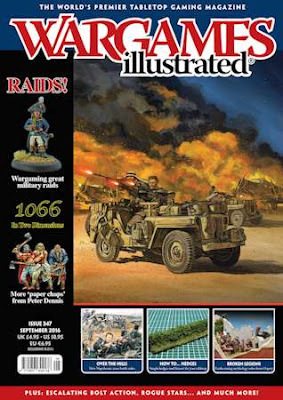 – Wargaming great military raids. THEME: STRIKE FAST, STRIKE HARD, GET OUT! An introduction to our theme, exploring the role of raids in history and looking at featuring these actions on the tabletop. Some ideas on expanding the gaming possibilities of a number of Flames Of War related products. Dash, derring-do and danger in the best traditions of the Royal Navy as we take a look at gaming with the inspiration behind the Hornblower novels. Nick Buxey and Richard Hattersley present an insight into another of their club projects, this time focusing on one of the most famous battles in Scottish history. The raids of JEB Stuart during the American Civil War are ripe for campaign play, so this article looks at how to run a series of games using any ACW ruleset. A closer look at this upcoming set of sci-fi skirmish rules from Osprey Games. A personal view on putting together a World War Two Long Range Desert Group force for the tabletop. Pail Davies presents another in his series of ‘make it yourself’ articles. The Pebble Island raid by the British SAS during the Falklands War, with ideas for gaming and new rules for the Living On The Frontline ruleset. A familiar story to many – one man’s quest to bring a visual spectacle to the tabletop. THEME: BIG DAMN HEROES, SIR! World War Two with a fantasy twist as we take a look at the concept and creative ideas behind this raid game designed to showcase the Panzerfauste rules. A photographic account of our visit to this well respected show held at the Tank Museum Bovington, UK.